Get notified when NHL All Star Game tickets are available! The National Hockey League All-Star Game is an annual event that fans of professional hockey look forward to every year. An exhibition game normally held during the mid-season break, the game actually consist of three separate games. During the first games, the teams made up of the best Atlantic players and the Metropolitan players compete and the Central and Pacific all stars compete. Then, the winners of each game battle it out to declare a winner. 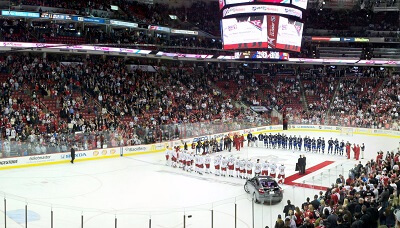 The location of the game changes every year, and normally the game takes place in January. You can buy NHL All Star Game tickets with the links above.